An idea so simple, yet so powerful. A must-have book! Does we need a predisposition to inspire other people, or is it something we can learn? Simon Sinek, internationally acclaimed speaker, try to answer this delicate question in his seminal book. Everyone, including myself, seems to applause the opinion of the author but many readers did not found the book as remarkable as the message it delivers. Yes, this book is a bit repetitive. Yes, the idea behind this book is incredibly simple that only a few pages could be enough to explain it. And yes, you could get the same idea just by watching the author’s short TED talk. But does the simple fact of hearing an idea is enough to convince you? For me, it takes a lot longer and that is exactly what this book is about: many interleaved true stories, slowly developed, chapter after chapter. As mentioned by the author, this book is not designed to tell you what to do or how to do it. Its goal is not to give you a course of action. Its goal is to offer you the cause of action. 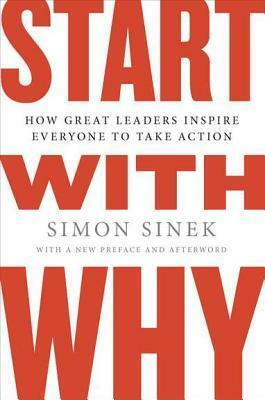 Start With Why is extremely well illustrated. We talk about the Wright Brothers, Martin Luther King Jr, or the perfect example of a company with a clearly defined why: Apple Inc. All along the book, I could not stop myself from saying: “Of course, that’s so evident!”, but it wasn’t before that. Start With Why is not just for organizations, aspiring to build a sustainable business with loyal customers and employees. Everyone will benefit from this book to understand why we buy such branch and not another one, why we choose to work for such company, or why manipulation sometimes works on us. Since the publication, Simon Sinek travels the world, inspiring leaders and organizations on how to find their why, from members of Congress to foreign ambassadors, from small businesses to corporations like Microsoft and 3M, from Hollywood to the Pentagon. Now, it’s your turn to be inspired by this fascinating book!